We are actively searching for Jewish university students in Ottawa, Ontario. If a person is interested in becoming an active member in the fraternity they are classified as a rush. There is a rush period to assess these candidates. If a rush is seen to have potential as a Brother in the fraternity they are invited to become a pledge. This pledge will then go through a program of pledgeship that can lead to the individual becoming part of the fraternity. As a rule a potential rush must be a student of Carleton University, or of the University of Ottawa or Algonquin College. A rush must also be of the Jewish Faith. An individual should also be in First - Third year. Fourth year students will not benefit from joining our fraternity because they will not have the time to enjoy the Brotherhood over the course of several years. There are two rush periods; the fall and winter. An individual has a chance to come out to events and experience fraternity life during this period. 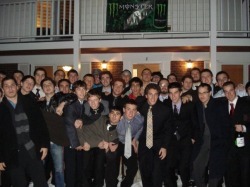 If potential is seen in a rush the brotherhood may welcome him to become a pledge. This pledge will then have a chance to become a full brother of our chapter of Alpha Epsilon Pi. If you are interested in finding out about rush events or just want to meet brothers in our chapter feel free to contact us. Our Rush Chair, Daniel Tsyganovskiy, would be more than pleased to answer any questions you may have. You can contact him at (613)-218-9227. Upon entry into our chapter an individual can gain many things. Our fraternity acts as a link to other Ottawa greek societies; both sororities and fraternities. This will give you access to greek events and parties in the Ottawa area. Being a brother in our chapter also makes you part of a large international fraternity spanning Canada and the United States. The chapter regularly goes on trips to other chapters in other cities to have a link to our international presents. Some have the impression that a fraternity is only for partying. This, however, is not the case. Our Fraternity is about scholarship, and philanthropy projects as well as having a good time. Many events are planned throughout the fall and the winter semesters that brothers actively take part in. The social part of the Fraternity is part of being a brother but not the most important part. Being a Brother is a unique and special experience in a young man's life.